Welcome to Digital Digest! We've got a much shorter version of Digital Digest than usual this week, and that is because we're going to be making a few changes to what we do here each and every week in the upcoming weeks... but don't worry, we'll still have all of the features that you enjoy about Digital Digest and a few new things in a "new and improved" format that will debut in a few weeks! We'll be changing the way that we post our reviews, so for this week, we won't have a review in Digital Digest (but don't worry, we'll still have all of the reviews that we've always had, just in another format). So this week, we're back with your news, a preview at releases for next Tuesday, and our Follow Me. Let's get going! It hasn't even been a month since Fox released Family Guy - Volume Eleven, and now, Family Guy - Volume Twelve is already in the works! Set for a December 17 release, the three disc set will come at a $39.98 MSRP and will include all 22 episodes of the 2012-2013 of the series (meaning that the DVDs have essentially caught up with the broadcast season). Meanwhile, Fox also released a pair of new MOD releases this week. First up, the entire series of a recently canceled ABC series is available in Don't Trust the B---- in Apartment 23 - The Complete Series. Also, the Fox series Raising Hope continues on DVD in MOD form in Raising Hope - The Complete Third Season. Both sets come at a $29.94 MSRP. For those who want Mama's Family in smaller chunks, Time-Life is preparing to release another season of the series on February 25. That is when fans will see Mama's Family - The Complete Third Season on DVD. Of course, if you can't wait until then, you can already enjoy the entire series on DVD with Mama's Family - The Complete Series. Tuesday (October 15) brings a little more "winning" to DVD with Lionsgate's release of Anger Management - Volume Two (DVD/Blu-ray). 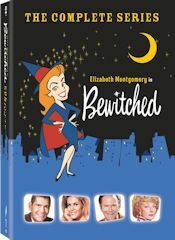 If you're a fan of older series and haven't picked up the previous DVD releases, Sony has plenty of value-priced complete series releases, with Bewitched - The Complete Series, I Dream of Jeannie - The Complete Series, and The Partridge Family - The Complete Series. Finally, Fox brings together the three original seasons of Arrested Development in Arrested Development - The Three Original Seasons. Who to Follow: Reno Wilson (Twitter), "The Actor. I play Carl on Mike and Molly on CBS Mondays@9:30 & I've been on other stuff too! Lover of run, spin and yoga sweat. I believe the cup is Half-Full!" Claim to Fame: Reno Wilson is an actor, comedian, and voice actor that TV audiences first saw in his small role as Howard on The Cosby Show in the 1980s. Following that role, he went on to many guest roles in other series, including Martin, The Fresh Prince of Bel-Air, Coach, and Scrubs. In recent years, though, he has been in his most recognizable role as Carl McMillan in the CBS sitcom Mike & Molly, which will return to CBS in just a few weeks.